Buy the OCGenie Now !! 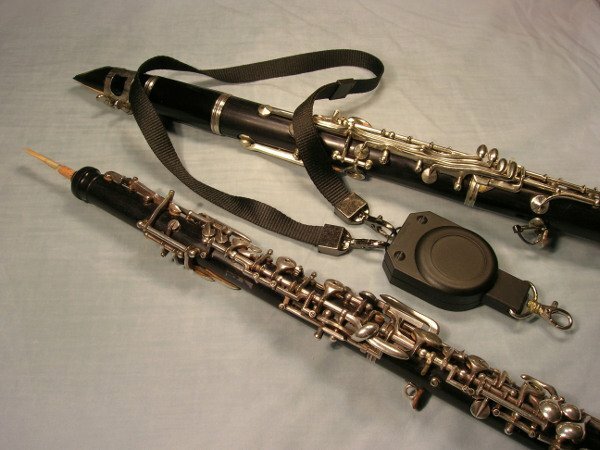 Being a music enthusiast, the inventor of the Oboe/Clarinet Genie (OCGenie) has read stories of professionals and amateurs having to quit playing the Oboe, Clarinet, Oboe d'Amore, Basset Clarinet, or English Horn due to the unbearable pain in their right thumb, hand, elbow, or shoulder. The OboeClarinetGenie (OCGenie) is a breakthrough invention (US.Pat.No. 7,655,853) that works like a player's secret assistant. Diligently and faithfully, it adjusts itself at every instant, reducing by a pound the weight on your thumbrest. It lets you preserve your embouchure and accommodate all your expressive movements with the music. It will help you to control your instrument noticeably better in the way you have learned well before; and it shall not impose any movements against your will that can jam the reed into your lips or teeth. Here are verbatim some Maestro's generous endorsements that cause the OCGenie to offer you “Your Complete Satisfaction or Your Money Back” , “3-Year Warranty” , and more. The OCGenie will bring great relief to young players who have to cope with the weight of the Clarinet on the right thumb. For players with carpal-tunnel it is a most welcome tool. The OCGenie is a most welcome addition for woodwind players. Thank you for the opportunity to endorse the OCGenie. Please use any or all of these statements that you feel would be valuable to your business ventures. In the High Street Stompers Dixieland Band, I often play clarinet constantly for stretches of time. This can lead to fairly noticeable thumb, hand, arm and shoulder fatigue. When I use the OCGenie, it really does neutralize the weight factor of the instrument and give me more facility, comfort, and endurance, allowing me to think about what really counts—the music! I have enjoyed using your marvelous Oboe/Clarinet Genie for the past several years, and I anticipate that it will last the lifetime of the instrument itself. With this product, I look forward to the next time I play, rather than dreading the thumb, hand, arm and shoulder fatigue that can often set in during lengthy playing sessions. Thank you for your very thoughtful and helpful invention(s) which aid the working musician in his or her creative and professional world. Eminently Trusted Wind Instrument Maintenance Expert, Music & Arts Co. The OCGenie has definitely made playing the clarinet more enjoyable via the ways it reduces fatigue and pain in your right thumb and hand. I can play much longer without discomfort. Fast passages are executed much easier. I wish you well and success with your marvelous contribution to clarinet + sax players.